Cribbage is a card game originating from the United Kingdom, and it is designed to be played by 2-6 players. The game is, at its core, a strategy-based card game, but it also has a distinct cribbage board that epitomizes the game type. The game has a strict set of rules and a unique scoring system, making it an acquired taste. The classic Cribbage game has quite a following, especially in its country of origin. It is commonly played in pubs, clubs and other places of gathering, and serves as a popular pastime among the UK-based public. 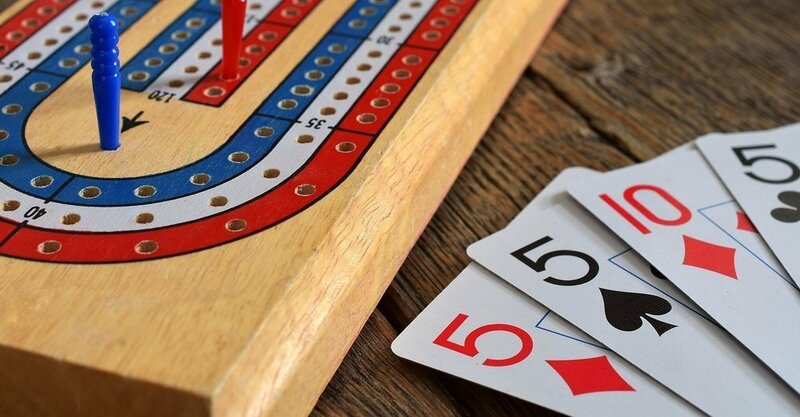 Cribbage’s most distinctive aspect is the board, and the same board style has been used since the game’s introduction in the early 17th century. The board serves as a makeshift scoring sheet, and is definitely one of the defining aspects of the game. A typical Cribbage board template is a sequence of holes, known as “streets”, laid out in a cyclic fashion. Scores are kept across the whole game, so two pegs are used per player. These pegs are used in an alternating fashion, such that the previous peg always remains to show the previous score. While that forms the essential score-counting part of the board, there are also certain other boards that incorporate a separate game-counter, which shows the number of games won by each side. How many holes are in a Cribbage board? The boards count score for each player, up to a maximum of 121, hence each line of peg-holes having a maximum of 120 holes in total. Cribbage is designed to be played by 2-6 players, and you really just need a deck of the standard 52-card deck to play Cribbage. The board is an added bonus, but can be substituted with a simple score sheet or counter if one is unavailable. The goal of the game is to be the first player to reach the score threshold of 121 points, though certain variations might prefer the 61-point limit instead. Scores are awarded for satisfying specific conditions, which will be described in detail in the Scoring section of the guide. We provide easy Cribbage instructions for the 2-player variant below. Regardless of the number of players, the turn order is determined through deck splitting. The player who reveals the lowest card goes first. Turn order then proceeds in clockwise order. The dealer shuffles the deck and proceeds to deal 6 cards to each player. These 6 cards form the hands of each player. Each player is then required to discard 2 cards, to form the crib. These discarded cards are placed face down, and will only be used in the Show phase of the game. At this stage, all players will have hands consisting of 4 cards, and the crib also contains 4 cards. The player to the left of the dealer will then cut the deck, and the dealer reveals the top card. This card will be the “starter”. Dealers rotate at the end of each round. The non-dealer goes first, and places a card from their hand face up in front of her, stating the count. The count is cumulative, so each successive card played by any player will add to this value. For instance, if the first card laid down is a 5, the non-dealer will say “5” as the count. The dealer then plays a 10 in response. The dealer will say “15” as the count, summing up all previously played cards. The count cannot exceed 31, and if a player is unable to play cards without exceeding the count, they will say “Go”. If all players call “Go”, the last player who managed to play a card will earn a point. The count is then reset to 0. As scores are awarded, the pegs are moved in a leapfrog fashion. For example, if the dealer gets 2 points, he places a peg 2 holes ahead. Once the play phase concludes, each player then places their hands face-up. Scores are the awarded based on the contents of each hand. The starter card that was revealed during the Deal phase is also considered in the combinations. When revealing each combination, the player is required to show each combination, and count the points out loud. The dealer, after counting his/her hand, also counts the crib, and adds valid combinations from the crib to his score. A player wins the game once he/she reaches the defined point threshold. There are specific rules one must follow in Cribbage, and there is the optional “Muggins” rule that can add a layer of strategy. The cards are valued with Kings being the highest card, and Aces being the lowest. Counts are called with the condition preceeding it. For example, a player will call their scores as such “Pair 2, Pair 4, Three of a kind 7, 15 9…” and so on. This applies to all phases of the game. If a Jack is revealed during the deck cutting, the player making the cut will be awarded 2 points. Runs do not have to be played in order. For example, Player 1 plays an 8, followed by a 10 from Player 2. Player 1 can then play a 9 to claim a run. Since the game involves calling out the valid combinations for scores, it is possible for players to miss some scorable sets. If other players observe these missed point opportunities, they can call “Muggins” to claim the points. Note that this is an optional rule, and some people play without this rule. Dealer is determined by deck cutting. Each player discards 2 cards to the crib. The non-dealer cuts the deck to reveal the “starter” card. The non-dealer begins by playing a card, followed by the dealer. The play continues until all players have clear their cards from their hand. The Show phase commences, and each player counts their hand. The dealer counts the crib. The dealer rotates at the end of the round. When a player reaches the defined point threshold, they win. Cribbage scoring is based on the available combinations of cards, and each combination has a different assigned score. Once a player achieves the required points, they win the game. The highest score in Cribbage is 121, at which point the player wins. 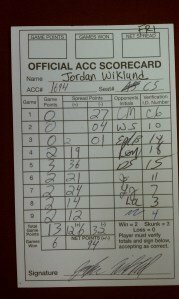 The standard cribbage scoring chart is shown below. There also several Cribbage scoring calculators available like this one. This is an example hand of Cribbage played from the deal to the end of the round. The players are then required to discard 2 cards to form the crib. A starter card of is A ♣ is revealed. The non-dealer begins by playing a A ♣. The dealer plays a A ♦, making a pair, getting awarded 2 points. The non-dealer plays his/her A ♥, making a three of a kind, earning 6 points. The dealer plays a 3 ♠, increasing the count to 6. The non-dealer plays a 6 ♣, increasing the count to 12. The dealer plays as 3 ♦, increasing the count to 15, earning 2 points. The remaining cards are played out without any points being earned by either player. The dealer’s hand has 2 pairs (3s and Aces with the starter card). The dealer gets 4 points. The non-dealer’s hand has a three of a kind (Aces with the starter card). The dealer gets 6 points. The dealer then counts the crib, but there are no available combinations. The dealer the rotates for the next round. What is the best hand in Cribbage? The best hand is ultimately subjective during the Play phase, but the highest score a hand can get during the Show phase is 29. The best possible hand is 5♠5♣ 5♥ 5♦ and any Jack. One of the four cards will be the starter card. This combination gives 8 different 15s for 16 points, a four of a kind worth 12 points, and a nobs worth 1 point, giving a total of 29 points. Discards are important, as the crib serves as a possibility for the dealer to earn extra points. Cribbage strategy revolves around choosing the right cards to play during the play phase. Remember, runs do not have to be played in order. The best cribbage players always have the count in mind, getting easy 15s and 31s. Take your time during the show phase, as you don’t want to miss potential points. Keeping runs during the Deal phase can help during the Show phase, but not necessarily during the Play phase. When was the game invented? Cribbage was invented in the early 1600s in Great Britain. You can read more on the history here. How many points is a Four of a Kind in Cribbage? A four of a kind is worth 12 points. What is a Skunk in Cribbage? A skunk is when a player wins with a 31 point difference with his opponent. What is a Flush in Cribbage? A flush is a combination of 4 or more cards in the same suit.